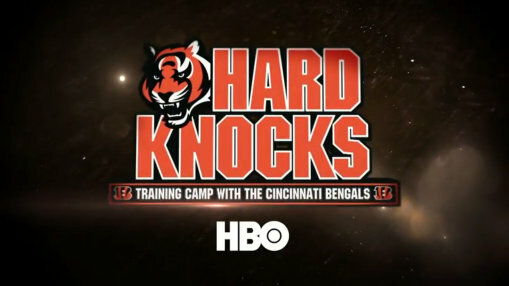 The show that gives fans the best glimpse into NFL Training Camp life has returned to HBO, featuring the Cincinnati Bengals with Head Coach, Marvin Lewis. This is the Bengals second stint on the show (they first appeared in 2009), but this time there is no Chad Johnson, who last played for the Bengals in 2010. 2. AJ Green. Green is the No. 1 receiver in Cincy, and he is also newly engaged to Miranda Brooke, his longtime girlfriend whom he met during his freshman year at the university of Georgia. Green is recovering from a bruised left knee and has not participated in camp since suffering the injury on day one. I can’t blame the team for shutting him down, but how HBO will spin this is a mystery to me. 3. James Harrison. The veteran Pro Bowl linebacker and Super Bowl champ is new to the Bengals after spending the majority of his career with the Pittsburgh Steelers. What he is not new to, nor keen on, are the Hard Knocks cameras. At every turn, Harrison avoids being filmed and flips the bird to let the crew know that he had no use for their intrusion. I hope that he warms to them at some point, though, because watching him being obstinate will get old very quickly. 4) Adam Jones. Yes, Pacman. While on the way to the first day of training camp, his car ran out of gas. He called his wife, Tishana, and road side service then left the car and hitched a ride to the nearby stadium with a passerby (who, as it turned out, worked at the stadium). Personally, I am interested in seeing a different Pacman than the one we’ve seen in the past, the one who was often in trouble. He has worked hard to continue his football career, so bring on Adam Jones the family man and wise veteran cornerback. 5.) Ladder Toss. During free time, a group of players engaged in a friendly game of ladder toss. I want to play Ladder Toss. Ladder Toss looks like fun. On a sad note, rookie undrafted free-agent Larry Black saw his season come to an abrupt end when he suffered a dislocated ankle and a broken leg during practice. His tears broke my heart. Chin up, LB. Check back next week for more observations and a recap of the next episode.